President Barack Obama's BlackBerry Hacked? According to FoxNews.com, Kasper Hauser has done the impossible - hacked into President Barack Obama's BlackBerry. All messages will be copied into a new book that will be released today by publisher Little Brown and Company. 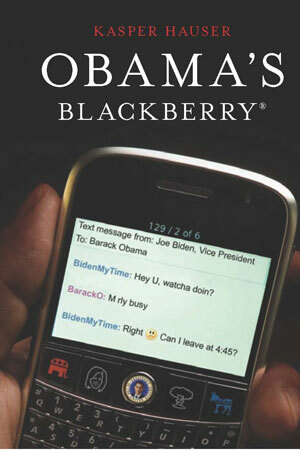 Obama's Blackberry features sensitive BlackBerry messages from the Commander in Chief, Vice President Joe Biden, Secretary of State Hillary Clinton, California Governator Arnold Schwarzenegger, and even Nuclear Command Control itself. Really, how could the President be so careless and foolish? How could this situation seem so... surreal? Well, maybe because it is. Fear not, Kasper Hauser is a San Francisco-based comedy group that wrote this book containing intermittent text messages between political figures so don't worry; the future of Western Civilization is not as endangered as we may have thought. The book's press release clearly states that it "is not endorsed, sponsored, affiliated with, or otherwise authorized by Research in Motion Limited, the owner of the trademark BlackBerry."